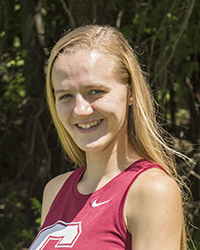 NOTES: One-year letterwinner ... 2015: Competed in all seven regular-season races during first year with team ... Season-best 6K time of 26:25.60 at the Gettysburg Invite ... Finished 35th at the PAC Championships in 26:43.0 ... Closed season with 21:10 at Wooster Twilight 5K. Class: Sophomore Hometown: Apollo, Pa.